On view from December 5, 2014, to February 14, 2015, will be the first exhibition at Galerie m Bochum of works by Stephan Schenk (*1962 in Stuttgart), who lives and works in Lüen in the Swiss canton of Grisons. Featured are tapestries and photographs from the series “Kreuzweg” (The Way of the Cross) that show in extreme close-up sections of the ground at World War I battlefields. The 14 tapestries in the series are adapted from photographic images and dominate the walls with their imposing size of 295 x 223 cm each. 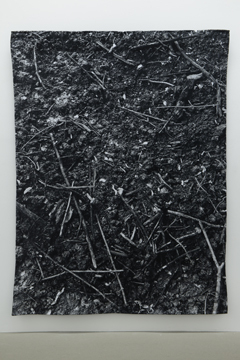 The woven works show closely observed details of the natural terrain: leaves, twigs, earth, grass, water. Nothing here betrays that we are seeing something extraordinary or spectacular. The viewer’s gaze roams aimlessly over the flora depicted, which differs from tapestry to tapestry. What captivates initially is the simple beauty of these woven pieces of nature. The tapestries exercise their appeal on a physical, spatial level that is very immediate and allows for little distance. The same can be said of the perspective taken in the works: the observer feels as though he is only a few centimeters above the earth’s surface and is facing it so straight-on that it is hard to tell up from down. Stephan Schenk has elected to show us in his works excerpts from historically momentous sites. He traveled to the former battlefields and used his camera to record the surface of the ground on which hundreds of thousands of people lost their lives. The location is not evident merely from looking at the resulting works. But their titles then open our eyes to where the photographs were taken. Verdun, Somme, Tannenberg – these names still summon today instant associations with World War I.
Schenk’s tapestries deliberately avoid any semblance of objectivity: the steep perspective and strong cropping allow no geographical location to be deduced. 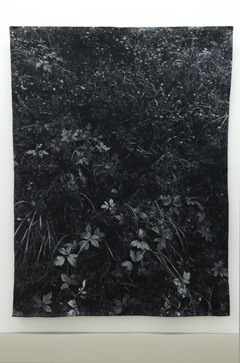 Translated into the medium of tapestry, the photographs are divested of the media properties that often give them a false air of objectivity. The details do not come into sharper focus as we draw near, and these are not images that are “inscribed,” so to speak, with their underlying meaning. Schenk instead works on the assumption that a traumatic event like World War I can never be objectively visualized. The photographs and tapestries in the series “The Way of the Cross” can therefore be understood more as an occasion and impetus to grapple with the theme, encouraging us to do so in various ways. The execution of the images in the medium of tapestry expresses in a fascinating way the idea of the “interwoven-ness” of fates and history. The title of the series also takes up this theme. Even more than the religious meaning of “The Way of the Cross,” which by all means plays a role here – World War I was already referred to by contemporaries as a “martyrdom” – Schenk is interested in the idea of standing at a “crossroads” and trying to choose the right path. This thought in turn evokes the fateful chain reactions that led to World War I.
Schenk seeks in his works to keep alive the memory of the victims and suffering of World War I – in the form of a culture of remembrance that is decidedly not objective but based instead on experience. “The Way of the Cross” opens up for the viewer myriad possibilities for reflection. Without a specific reading being imposed by the artist, there unfolds while viewing the works, and with knowledge of the sites they portray, an emotional play of thoughts through which the observer himself fills the images with content and significance.